To celebrate the arrival of the permanent Fabric of Football exhibition space in the National Football Museum, Classic Football shirts is exhibiting 500 of its greatest and most iconic jerseys. The display aims to capture memorable moments in the history of the game and document the evolution of football shirt design. It will also focus on the use of classic designs in the latest Nike and Adidas releases ahead of the 2018 World Cup which are due to go on public sale in mid March. The exhibition will include sections dedicated to the World Cup, European Championship, Champions League, Cup Finals, and more. Each will include shirts never displayed before and of extreme rarity. As the season approaches its climax and the buzz around the World Cup Finals kicks into full swing, there will be both a topical editorial angle to the event. 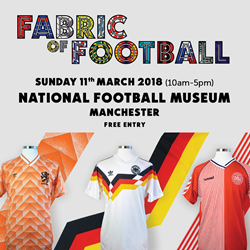 The National Football museum holds an esteemed reputation on both a national and international scale and provides an ideal venue for football fans of all eras to enjoy the exhibition, which is expected to draw 5,000 people to its free public event on Sunday 11th March.